SANTA CRUZ, Calif. – Santa Cruz Comprehensive Imaging, LLC, a joint venture between Dignity Health Dominican Hospital and Radiology Medical Group of Santa Cruz County, now offers 128-slice computed tomography (CT) scans to better diagnose medical conditions and diseases throughout the body. 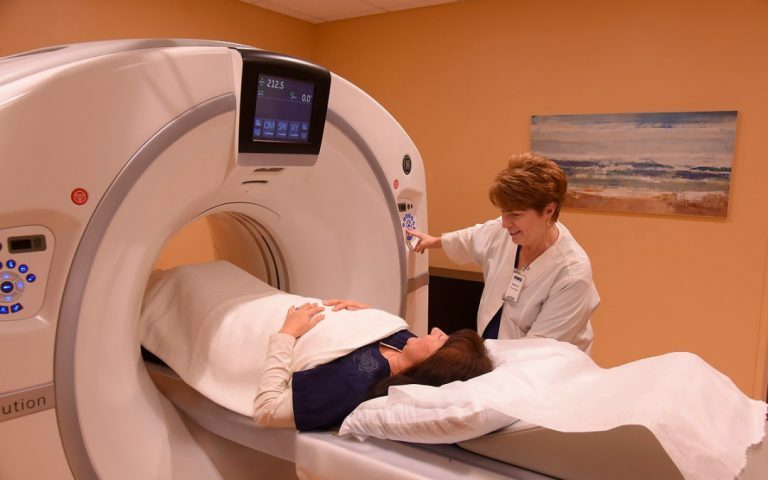 This ultra-fast, state-of-the-art diagnostic system delivers lower radiation doses while capturing cross-sectional internal body images in minute detail. The benefits of this new technology are substantial. The high-speed scanner generates exceptionally detailed images—called slices—of the inside of the body in a matter of seconds. This allows physicians to make more accurate diagnoses of certain diseases than with conventional CT. Due to its speed and accuracy, patients spend less time on the CT table with significantly less exposure to radiation. The new 128-slice CT scanner is used for all general imaging of the head, lung, spine soft tissue, extremity, and abdomen and pelvis. After the exam, radiologists provide prompt interpretation of all scans and are in direct contact with referring physicians to provide immediate access to images and the information needed for treatment planning. Also in collaboration with Radiology Medical Group of Santa Cruz County, Dominican offers the latest advancement in mammogram technology – three-dimensional (3-D) mammography, or tomosynthesis – for the detection of breast cancer.